Maternity Leave Wishes : Giving birth to a child is the most precious moment in a woman’s life. But the time before the birth and the time after the birth is equally important too! If someone close to you is expecting a baby or has recently become a new mom, you need to wish her well. If your colleague is about to take maternity leave or enjoying a maternity leave at this moment, you got to wish something. Maybe tell her to Take Care of her and the newborn, or take proper rest or even a simple congratulations! A baby break is a very important period in one’s career. If you are the friend, wellwisher, relative, boss or colleague of this expectant mother who gives her support and wishes her good things, she will be very happy for your appreciation! Here are some really wonderful maternity leave wishes and funny maternity leave messages for you to wish her Good Luck during maternity holidays! Its time to take care of the little angel you are carrying inside of you. 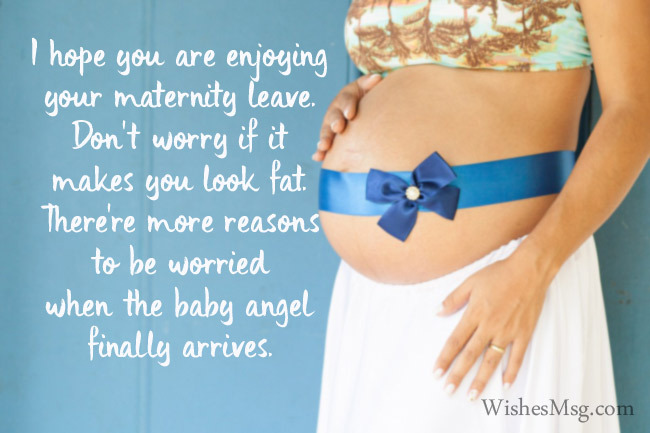 Enjoy every day of your maternity leave and make sure the angel lands safely in on this earth. There’s nothing in this world more satisfying than being a mother. Take care of you and your baby as much as you can. Stay safe and stay well! I want to congratulate you on this very special moment. The countdown begins from today. I can’t wait to see the little angel anymore! Take care of yourself and the baby dear! I hope you will give birth to the most beautiful baby in this world. But until then, you just enjoy your time and experience a wonderful maternity leave. God bless you! This is finest feeling a woman can ever have. I feel really happy for you. You deserve a beautiful angel in your life. Enjoy every moment until she/he arrives! You are the nicest colleagues I have ever worked with. You really deserve a wonderful maternity leave. I wish you have a good time there. Take care! You are a good person and a good employee. It’s my pleasure to grant you this maternity leave. My heartiest congratulations for the big moment. Till then, enjoy your time! I feel very happy for you right now. I wish God will bless you with a beautiful baby. You need to take good care of yourself. Enjoy this leave with your family! Every employee to me is like a part of the family. Its always good to hear that a new member is joining the family. I wish you all the best. Take care of yourself! This office will miss your service for a time being. But It will all be compensated when you return with a cute angel. My thoughts are always with you! I hope you will become an excellent mother just as you are a great employee here. You deserve this maternity leave well. God bless you and please take care of you! Granting you this maternity leave is one among the few satisfying tasks today. I feel really proud of you. Make the best use of this time and prepare yourself for the heavenly arrival. If having a fat tummy for nine months makes you sad, don’t be. Because the real struggle starts after it becomes flat again. So, enjoy while you still have it fat and good luck with raising a child. Maternity Leave? If you were smart enough, you would understand why it’s not called ‘Maternity Vacation’ like a ‘Summer Vacation’. Because, it’s not a vacation, it’s training for the worst! It’s just a matter of few months for you to say goodbye to your freedom forever! And look, everyone including you is just so much happy for it! Congratulations! Sleep as much as you can. Because, after a few months you will be busy wiping poop all night. Motherhood is great! A lot of good wishes for you my dear! I hope you are enjoying your maternity leave. Don’t worry if it makes you look fat. There’re more reasons to be worried when the baby angel finally arrives. Congratulations dear! I was just thinking that the arrival of a baby is the only time human feels happy knowing that their ultimate ruin is close by. What an irony. Working with you has always been a great experience for me. I wish you raise a child that’s just as good human being as you are! Enjoy your time as a new mommy! Take care! A woman like you deserve the best gift from God. I am really happy for you. But, at the same time, I know I will miss you a lot. God bless you! I have learned so many good things from you. I know you will be a great mother to your child. I can’t really wait to meet your little angel! See you soon! You have all the characteristics of an excellent mother. I know you’ll make a great family. God bless you and your child. My thoughts are always with you! It’s hard to say farewell to such a wonderful person like you. I will miss you so badly but I will always keep you and your child in my prayers. God bless you! Without you, this place is not the same. We all miss you so much. Take care of yourself. We wish you a safe birth giving and a beautiful baby. You always deserve the best! These messages are the perfect example of how to wish a colleague going on maternity leave. Wish her good luck and happy maternity holidays with family by choosing any of these wishes messages. You may use these messages in a card, maternity leave goodbye email to colleagues or in a funny maternity leave farewell speech. This will make her very happy and thankful towards you!